The Illinois Talking Book Outreach Center (ITBOC) will consolidate with the Illinois State Library Talking Book and Braille Service (ISLTBBS) on September 1, 2017. Public libraries are looking for ways to better serve all their citizens including those who don't or can't come to the physical library. Together we can help each other reach and serve those eligible patrons. ISLTBBS, as the only talking book center in the state, will need your help in speaking to groups in your community, reaching out to eligible patrons, and being the experts in town to provide the needed information links. 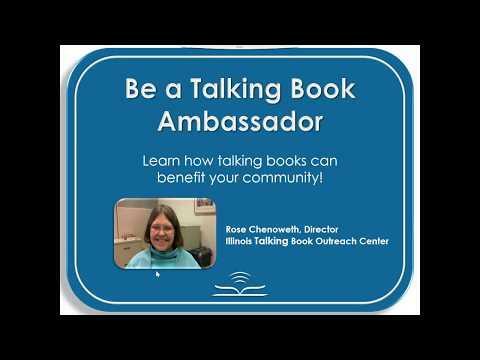 Come learn about talking book services and join our Talking Book Ambassador program. This webinar is approximately 1 hour and 10 minutes in length and was originally broadcast on May 24, 2017.